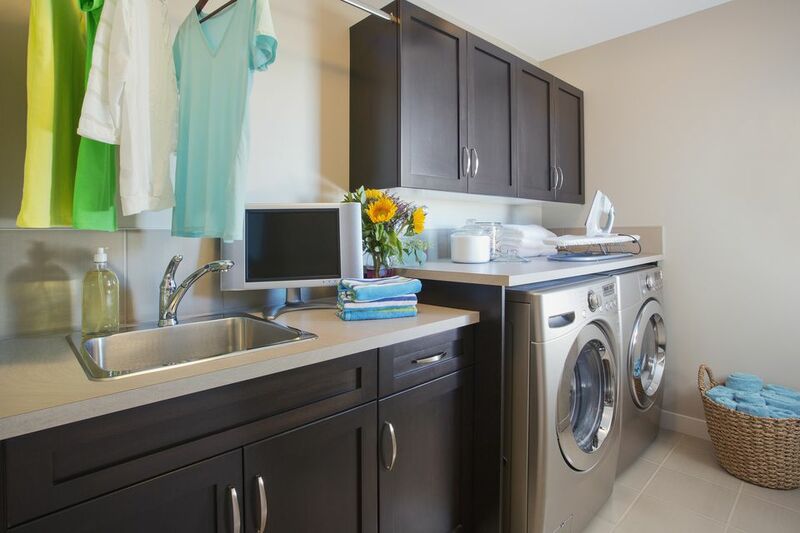 A utility sink in the laundry room or garage can be very useful for all sorts of clean up. Installing or replacing a utility sink faucet is an easy project that usually takes no more than 30 minutes in most situations. Whether you are installing a faucet in a new utility sink or replacing an existing faucet, this project can be completed by one person with just a few basic plumbing tools. Here is a quick guide for how to remove and replace a utility sink faucet in an existing sink. No two installations are exactly the same, but this should give you an overview of what to expect when doing this project yourself. Shut off the water supply for the faucet by turning off the individual shut-off valves under the sink. Make sure the water is fully shut down by trying to turn on the hot and cold sides of the faucet. If the water is not completely shut off, then you may have to shut off the main water supply. If there are no dedicated shut-off valves, turn off the water supply to the house while working on the faucet installation. Disconnect the hot and cold water supply tubes to the faucet. These may require a basin wrench, pliers, or a specialty tool to remove. The flex lines need to be turned counterclockwise until they can be pulled off of the faucet. Sometimes you can reach the supply tubes from the side of the sink, which makes it easier to remove them. If not, you will need to reach up behind the sink. Remove the faucet nuts, which hold the utility faucet to the sink. Remove the faucet nuts with a basin wrench, pliers, or specialty tool. Then, pull the faucet straight up and off from the top of the sink. Clean the top of the sink where the old faucet sat to help prepare for the new utility faucet. Prep the new faucet. If the new faucet comes with a foam or rubber gasket, then you do not need to use plumber’s putty. Otherwise, put a generous ring of putty around the base of the faucet to make a waterproof seal between the faucet and the sink. Set the faucet in place, and squeeze the putty down a bit by pushing down on the faucet. Thread the new mounting nuts onto the faucet from under the sink and tighten them. As you tighten the mounting nuts, keep checking to make sure that the faucet remains aligned and straight. Putty will squeeze out from under the faucet, leaving a putty rim on the top of the sink. When the faucet is tight, scrap off the excess putty with a putty knife. Thread and tighten the hot and cold water supply tubes onto the bottom of the utility faucet. These can be started and tightened by hand, but give each a 1/4 turn more with pliers or a basin wrench. Turn the water supply back on and run some water to make sure the connections are leak-free. Tighten anything that leaks, or replace the old supply tubes if they need it. What Are the Types of Water Shut-Off Valves?